For American Tier III cruiser St. Louis, click here. Initial HE Shell Velocity876 m./s. 100 mm/45 Mle 19317 х 2 pcs. 40 mm/56 Bofors Mk112 х 2 pcs. 20 mm/70 Mk420 х 1 pcs. 100 mm/55 CAD Mle 19457 х 2 pcs. 40 mm/56 Bofors Mk18 х 2 pcs. 20 mm/70 Mk412 х 1 pcs. Saint-Louis — French Tier IX cruiser. A heavy cruiser project included in the last shipbuilding program during wartime. The ship was equal to ships of the preceding project but the absence of treaty restrictions allowed her to have a larger displacement and reinforced AA capabilities. Saint-Louis is a strong Tier IX cruiser. She is a direct upgrade in nearly all respects from Charles Martel. She keeps the 3x3 203mm main armament that is a feature of the previous French heavy cruisers. Firepower is similar to the Charles Martel, improving on the already excellent range and gaining the option to improve the rate of fire using the new, final upgrade slot. Most improvements, however, are defensive. While her rudder shift and turning radius are a little poorer than her predecessor, Saint-Louis does pick up half a knot of speed, 2,900 more hit points, and most crucially, a Repair Party, allowing her to play more aggressively with the promise of being able to recover some health later. Her anti-aircraft armament is also considerably reinforced; though not on the level of ships like Neptune, Saint-Louis still can be a strong deterrent to enemy aircraft. The combination of Advanced Firing Training and AA Guns Modification 2 is powerful, and with the addition of Basic Firing Training Saint-Louis will shoot down planes without much of a struggle. A full AA build isn't necessary in order to make the AA work, just a few skill points or modules here and there will do the job. The French cruisers' special consumable, the Engine Boost ( ) consumable, may seem underwhelming at first, but it can become a very useful tool. With Engine Boost activated, Saint-Louis can juke back and forth very rapidly, dodging incoming shells and frustrating enemy ships. Peeking in and out of cover to take shots with Engine Boost active means that Saint-Louis spends as little time as possible vulnerable to the enemy while still being able to do tons of damage. However, there is one major weakness with Saint-Louis. The armor, like the rest of the French cruisers, is poor. Saint-Louis requires the player to keep attention to the enemy ships at all times, and the slightest of mistakes in positioning may be heavily punished with multiple citadels. Saint-Louis has a fairly high citadel, so any broadside presented may be the last broadside presented in the battle. This ship has most of her guns towards the front, keeping 2/3 of her firepower when bow-on, but she will still take massive damage from battleship Armor Piercing shells while bow-on. Saint-Louis will not last long under sustained heavy fire, so positioning and knowing when to engage in fights is of utmost importance. Decently fast for a cruiser of her tier, and with the Engine Boost ( ) consumable this ship is super nimble. Good shell velocity and shell trajectory, along with an incredible 18.3km firing range. Anti-aircraft (AA) suite is decent, and can be very powerful when specialized for AA. As with the rest of the French cruiser line, Saint-Louis has sub-par armor. Can only launch 3 torpedoes from each side of the ship. Research Hull (B) first, then research the upgraded Gun Fire Control System. Then start saving up for Henri IV. For Upgrade Slot 1, take Main Armaments Modification 1 ( ). This helps prevent main battery and torpedo tube incapacitations. For Upgrade Slot 2, take Steering Gears Modification 1 ( ). However, if the player has the special Engine Boost Modification 1 ( ), mount that instead. This modification takes the French cruisers' specialty, the Engine Boost consumable, and increases its duration by +50%. For Upgrade Slot 3, take AA Guns Modification 1 ( ). Saint-Louis' has powerful long range anti-aircraft (AA) guns, and taking this modification makes them even more powerful. For Upgrade Slot 4, take Steering Gears Modification 2 ( ) to decrease rudder shift time. Propulsion Modification 2 ( ) is also a possibility for players who want to make the most out of the Engine Boost and give the ship incredible acceleration. For Upgrade Slot 5, take Concealment System Modification 1 ( ). The additional stealth is necessary for a lightly armored cruiser and will aid in getting to positions without getting spotted. Alternatively, Steering Gears Modification 3 ( ) can be used for maximum maneuverability. For Upgrade Slot 6, there are several different modules to take depending on ship build. Main Battery Modification 3 ( ) significantly helps decrease reload time, cutting over 1 second off reload time. Alternatively, Gun Fire Control System Modification 2 ( ) may be taken for players who prefer to engage from long ranges. Players may also choose AA Guns Modification 2 ( ) for an AA build. 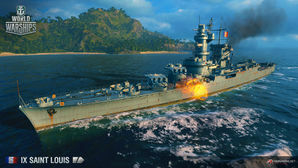 Players who wish to spend doubloons can equip Saint-Louis with Type 19 camouflage that lowers her detection radius, reduces the accuracy of incoming shells, reduces her repair costs, and increases the amount of experience she earns. Saint-Louis shoots down Shokaku planes. A Fletcher is gunned down by Saint-Louis. The Saint-Louis class was an un-built class of heavy cruiser drawn up on the eve of World War II and was the last heavy cruiser designed for the Marine Nationale. Previously known as the "C5" cruiser, the Saint-Louis class was conceived in 1939 as a replacement to the aging Duguay-Trouin class, and was based off of the previous Algérie class. Due to the expiration of the Washington Naval Treaty, French designers were no longer limited by the treaty's 10,000 ton maximum displacement limit so they were able to design a ship that was larger, faster, better protected, and, through the introduction of a semi-automatic loading system, much more heavily armed. In the end, the final design exceeded her predecessor's size considerably: weighing in at 15,000 tons normally, and nearly 19,000 tons at full load. The design was approved and accepted by the navy on 1 April 1940. Saint-Louis would have been laid down at Arsenal de Lorient in September 1941, launched in January 1943, and in service by January 1944. Henri IV would have been laid down at Ateliers et Chantiers de France in Dunkerque in November 1941, launched in March 1943, and in service by March 1944. Charlemagne would have been laid down at Ateliers et Chantiers du Havre (ACH) in December 1941, launched in May 1943, and in service by June 1944. Brennus would have been laid down at Arsenal de Lorient in March 1944, launched in May 1945, and in service by June 1946. Charles Martel would have been laid down at Ateliers et Chantiers du Havre (ACH) in May 1944, launched in July 1945, and in service by September 1946. Vercingétorix would have been laid down at Ateliers et Chantiers de France in Dunkerque in September 1944, launched in October 1945, and in service by December 1946. In the end, the invasion of France by Nazi Germany stopped all discussion about the class, and the subsequent occupation of France resulted in the project's abandonment. This page was last modified on 19 February 2019, at 08:56.